I've always known fuel efficiency is not the best feature of my car. My car is helpful in many ways, but the MPG is shameful. Unfortunately, it isn't worse than other cars in it's class and there are many of them on the road. I have kept the car because I use all the 3 rows of seats to carpool across town. I also have been anticipating bigger advancements in hybrid offerings and was biding my time to switch cars when I could find one that is significantly more efficient than mine. With the price of gas skyrocketing, I thought I should start my search sooner rather than later. I started by looking up some models that had caught my eye on Yahoo Autos to see how they compared. I looked at MPG, how many kids it could seat (using boosters), cargo capacity and the Yahoo Green rating. I ended up scraping the cargo capacity findings because I wasn't sure they were accurate. For instance, they claim the Honda Fit has more cargo capacity than my Chrysler Pacifica. In reality, I wouldn't be surprised if the Fit could fit in my Pacifica! Personally, if I were to replace my car at this point I would really want the MPG to be as high as possible (35+, but over 40 is even better). You can actually search for new cars by MPG very easily on Yahoo Autos. As I research car options I have learned that there are some exiting things on the horizon and perhaps I will wait a little bit longer. For instance, here in the Bay Area it is expected that Prius sales may start to have wait lists again soon. Plus, I read on hybridcars.com that "according to an inside company source, Toyota dramatically reduced production of the Prius sedan when it began retooling its production line for the 2009 model year. The new model is expected to be slightly bigger, faster and more efficient than the current version. In addition, company sources confirmed that Toyota is preparing to offer a wagon version of the Prius in either 2009 or 2010." A wagon version?! Hurry up, people! There are also some new clean diesel cars that are promising impressive results, such as a Mercedes Bluetec or a VW TDI engine. Hybridcars.com reports, "VW says the Jetta will get more than 50 miles per gallon on the highway (40 mpg around town), and can go over 600 miles between fill-ups." It's not a hybrid, but the TDI is a clean diesel which is promising excellent MPG. So for now I will drive as efficiently as possible and hope that new options come sooner than later. 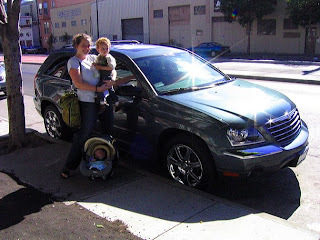 We are waiting to replace our VW Golf with a VW Jetta TDI Wagon. With #2 on the way, it seems like the best option for mpg, cargo and safety at the moment, even if diesel is a little more expensive. I think this car is due out in the US later this summer. You know we love our Mazda5. We generally get a bit better mileage than the official numbers. On our trip to LA last year, we averaged around 33 mpg - not bad for a people mover. It's fun to drive, compact, and inexpensive - plus you get free beer with every fill up. tom, i love your mazda 5, too! i especially like the sliding doors and 3 row seating in such a compact size. very versatile. and the beer, well, you can't beat that. By the way, thanks for the 'exploding candy', we all had a fun time eating it! I'll be watching your research closely, as we'll be in the market for a new car in early 2009. When you say how many kids can fit, is that in car seats and/or boosters? I'm in the same boat: must be able to fit at least our own kids, plus a friend or two for carpools! But, still want adults able to fit back there, too. Yes, Toyota: HURRY UP with that Prius wagon!! My husband is threatening to get a motorcycle!! Last fall my husband and I replaced both of our gas guzzlers because we felt like such hypocrites and we needed to save $$$! We are such a green family but were driving a 3/4 ton truck and a Nissan Murano SUV. Now my husband drives a Camry Hybrid and I have a shiny red Prius. The amount of money we save on gas per month (around $400) more than pays for my car! Both cars have very high safety ratings and we saved thousands of the MSRP because we bought them in the fall. Now that gas prices are nearing $5 per gallon her in So.Cal, I don't think deals can be had, but still... totally worth it! great job on switching your rides! so, as a family, which can you tell me a little about space in the camry vs. the prius? how many kids can fit and how about grocery bags or gear? thankfully my kids are downsizing their car seats a bit, which helps squeeze more kids in the back. being able to drive a little friend sure is helpful sometimes. I just made a cool list of Yahoo's Top 100 Green Cars in blist. Check it out!